U.S.-imposed oil sanctions on Venezuela, announced this week, are part of a larger strategy to both pressure and entice the country’s military to help oust socialist President Nicolas Maduro, according to analysts. “That is the theory. That it is the gamble. That’s the hope. Whether that happens or not, it’s very hard to tell,” said Michael Shifter, a Latin America analyst and president of the Washington-based research group Inter-American Dialogue. The U.S. imposed sanctions on Venezuela’s oil industry after recognizing Juan Guaido, the president of Venezuela’s National Assembly, as that country’s interim leader. More than 20 nations, including Latin American neighbors Brazil and Colombia, have recognized Guaido as interim president after refusing to accept the results of last year’s disputed election, in which Maduro won after barring most opposition candidates from running. Guaido claimed the role of acting president after Maduro’s first term in office expired in January, and, pending new elections. China, Russia and Cuba continue to support Maduro, who was recently sworn in for a second term. Maduro refuses to step down but has said he is prepared to negotiate with the opposition to resolve the current crisis. Venezuela has the world’s largest proven oil reserves, even bigger than Saudi Arabia, and Venezuela’s oil industry accounts for more than 90 percent of the country’s export revenue. In recent years, however, its economy has collapsed with the worldwide drop in oil prices. Oil production in Venezuela also fell because of neglect and lack of investment after the government nationalized the industry. 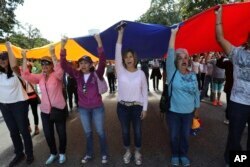 Members of the opposition hold up a Venezuelan flag and sing their national anthem before handing out explainers to soldiers and police about an amnesty law, near Fort Tiuna military base in Caracas, Venezuela, Jan. 27, 2019. The Venezuelan military is seen as key to Maduro’s hold on power. The military’s commanding ranks were purged of dissenting officers after an attempted coup against President Hugo Chavez in 2002. Those ranks have remained loyal to Chavez’s successor despite increasing political repression, corruption, hyperinflation, food and medicine shortages, and an exodus of more than 3 million people fleeing upheaval and poverty. Guaido has not called for a military coup but offered amnesty to soldiers and officers who agree to end their support of Maduro. “He has approved an amnesty law in order to establish transitional justice for all the military, all the members of the armed forces, [who] will put their strength to re-establish democracy,” said Gustavo Tarre, who was appointed Venezuela’s new permanent representative to the Organization of American States by Guaido’s acting government. Venezuelan Colonel Jose Luis Silva, Venezuela’s military attache at its Washington embassy to the United States, after announcing that he is defecting from the government of President Nicolas Maduro, Jan. 26, 2019. There are reports of growing discontent among midlevel officers who are also suffering from the food shortages and oppose being used to suppress growing protests by citizens. “My message to the armed forces is, ‘Don’t mistreat your people. We were given arms to defend the sovereignty of our nation. 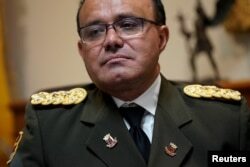 They never, never trained us to say, ‘This is for you to attack your people, to defend the current government in power,’” said Colonel Jose Silva, Venezuela’s defense attache in Washington, after breaking recently with Maduro to support Guaido. The authoritarian governments of Chavez and Maduro had worked to ensure the military’s support by spending generously on arms purchases and providing more than 200 generals with lucrative privileges including subsidized housing and food. Some senior military officers, along with high-ranking members of the Maduro administration, have also been implicated in illicit drug trafficking in the country. Venezuela has become a key transit point for illegal Colombian cocaine shipments to the United States and Europe. There are concerns that Venezuela’s military leaders have become so entangled in illicit activities and human rights abuses in support of the Maduro government, that neither oil sanctions nor the promise of amnesty will convince them to change sides. “I think that they don’t have a lot of confidence that if they give up power, give up supporting Maduro, that somehow they are going to escape punishment,” Shifter said. Maduro maintains that the armed forces remain loyal to him, has called military officers who support the opposition, “deserters” who seek to divide the nation, and accused Guaido of staging a U.S.-directed coup against him.